Welcome to my world of exploring the sights of Sydney with my two fun and feisty ankle biters in tow. For more of our crazy times, check out www.mummymuckups.com ; memoirs told through sleep deprived eyes and a heart full of love. 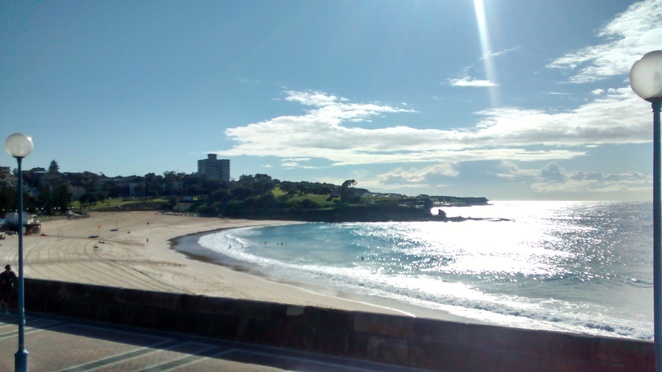 To Coogee or not Coogee? Often we are so busy scheduling play dates and pricey outings for the kids, that we forget the beauty of the best free playground there is. On a recent, glorious, Sydney spring day, I decided I really do like to be beside the seaside. If you can overlook the sand that WILL end up in every possible nook and cranny possibly known to humanity, then get yourself down to the beach. Personally, I am a fan of Coogee for the kids. It has a natural break provided by Wedding Cake Island and a perfect little toddler wading pool created by the overflow from the 'official' rock pool. The clincher for me is, as I parent, I am generally a fan of anywhere with close proximity to the toilets for the little ones. Wave jumping is a fave for us, but swimming does not even have to be on the agenda. bring the kids bucket and spades and throw in a few toy trucks and bulldozers, too. 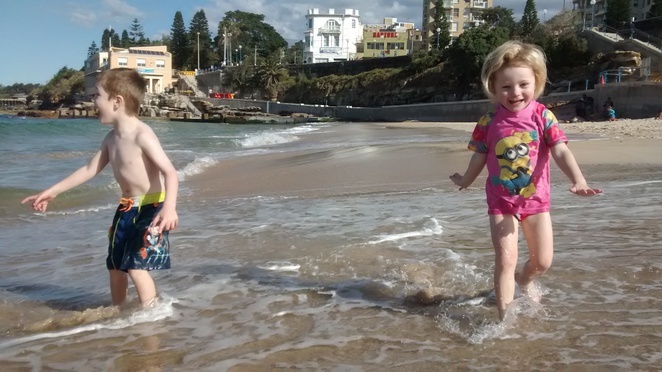 slip, slop, slap as always; never underestimate our Aussie sun and your child's delicate skin. check out the free BBQ's provided by, and beautifully maintained, by the Randwick City Council. That unbeatable smell of BBQ meat is a tangible reminder that summer is fast approaching. bring plenty of water and snacks, but note that Gelatissimo ice-cream (a little piece of heaven) and Chish 'N Fips (surprisingly fair prices), are located super close if the kids have been promised a 'be on your best behaviour' treat. Leave your bags unattended; you might be lucky, but of course, then again, you might not be. Leave it too late in the day to go. If a hot day is forecast, get down there early. Parking can be tough. ignore the warnings of the lifesavers and if you choose to swim, make sure it's between the flags. whinge about the works on the foreshore. Yes, they are an ugly, noisy, eyesore right now (though watching those diggers is an outing in itself for my kids), but the addition of a new amenities building will hopefully be worth the wait. My kids love it when I get the beach bag out and the sandcastle competition always gets a little serious (must remember to 'let' the kids win sometimes). Fresh air, creative play and no screen time, makes this outing a sure thing winner, and hopefully you may even get a little peace and quiet time, just for you. A fabulous article, Mummy Muckups, love your humour too! A great article covering all the basics for a good day out. Sometimes we forget how much joy children get from the simple things.